Only a few times since I started shooting live music a few years ago have I faced lighting as low as this. It was of course Hallowe’en, and Therapy? 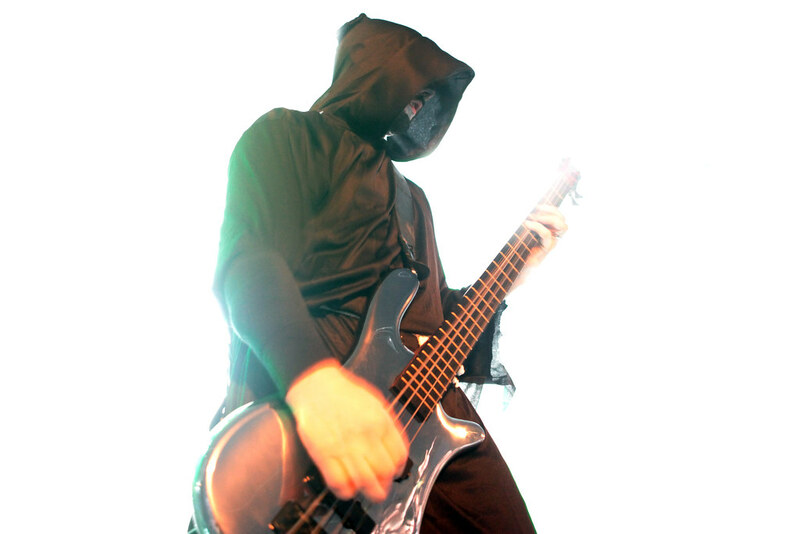 were dressed in black (grim reaper style) cloaks and hoods, with face paint. Set against a black backdrop, with hardly any front lighting and harsh backlights and strobes, this was a pretty tricky affair. The other photographer in the pit was livid at being told to turn off her flash, and I heard her later being denied to return to the photo pit to try and recover something from the event. Any comments on this shot would be appreciated. More shots are available: Therapy? and support, Ricky Warwick.